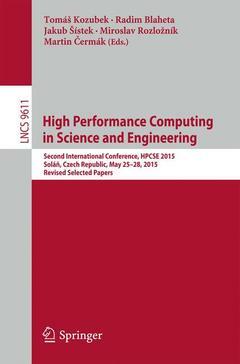 This book constitutes the thoroughly refereed post-conference proceedings of the Second International Conference on High Performance Computing in Science and Engineering, HPCSE 2015, held in Solá?, Czech Republic, in May 2015. The 14 papers presented in this volume were carefully reviewed and selected from 21 submissions. The conference provides an international forum for exchanging ideas among researchers involved in scientific and parallel computing, including theory and applications, as well as applied and computational mathematics. The focus of HPCSE 2015 was on models, algorithms, and software tools which facilitate efficient and convenient utilization of modern parallel and distributed computing architectures, as well as on large-scale applications. Large scale lattice Boltzmann simulation for the coupling of free and porous media flow.- CHRONO: An open source multi-physics dynamics engine.- Parallel computing in multi-scale analysis of coupled heat and moisture transport in masonry structures.- An Equation Error Approach for the Identification of Elastic Parameters in Beams and Plates with $H_1$ Regularization.- A comparison of preconditioning methods for saddle point problems with an application for porous media flow problems.- Efficient Implementation of Total FETI Solver for Graphic Processing Units using Schur Complement.- Solving contact mechanics problems with PERMON.- Many Core Acceleration of the Boundary Element Method.- Parallel implementation of collaborative filtering technique for denoising of CT images.- On Modeling of Bodies with Holes.- Analysis of model error for a continuum-fracture model of porous media flow.- Probabilistic Time-Dependent Travel Time Computation using Monte Carlo Simulation.- Model of the Belousov-Zhabotinsky reaction.- Parameter identification problem based on FRAP images: From data processing to optimal design of photobleaching experiments.